This second day of the empowerment began privately as the Gyalwang Karmapa performed the lama’s preliminary practice for the empowerment (dbang sgrub). During this time, the Vajra Master enters into a samadhi focused on the deity to actualize its special qualities. 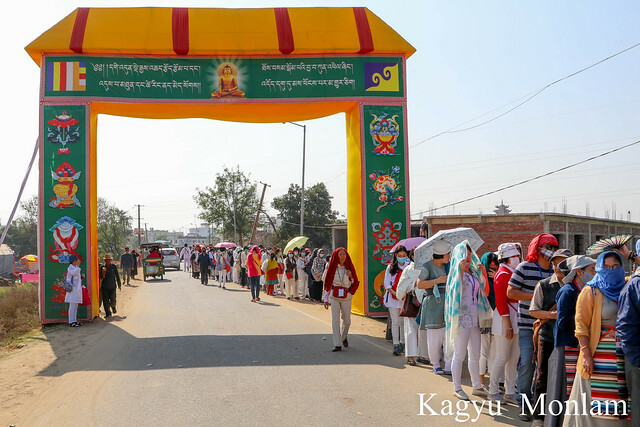 This middle day of the ritual is known as the preparatory empowerment (stag gon gyi dbang) as it prepares the disciples to receive the actual empowerment on the third day. Today the stage was the same as the night before, except that in stage center, the grand black and gold peacock throne has been unveiled. At the top of the back panel is a golden image of Amitabha, on the front of its tall table is a pair of his mount, the peacock, and the stairs leading up to the throne are decorated with a swirling, powerful dragon. The Monlam Pavilion in front of the throne was filled with a sea of the ordained sangha and lay community. His Holiness entered wearing a magnificent peach and yellow chögö (outer cloth), and finishing three bows, took his seat on the peacock throne. After the preparation of setting up the vajra tent, he reminded the disciples how important bodhichitta is and that the reason for receiving this empowerment is to nurture our ability to bring all living beings to the state of perfect awakening. After a mandala and the representations of body, speech, and mind were offered to His Holiness, he explained that he was giving the empowerment since this year he will be teaching the guru yoga from the Torch of True Meaning as well as the Four Session Guru Yoga of the Eighth Karmapa, Mikyö Dorje, and one should have an empowerment for these practices. In speaking of the benefits of this empowerment, the text states that having received a human body, we must make it meaningful. This does not mean becoming powerful physically but developing the power of our mind so that we can greatly benefit others. In particular, human beings have prajna (wisdom) that allows them to engage in Dharma practice and differentiate what they should and should not do. Since we have the leisure and resources to practice, we should not procrastinate but engage right away since everything is impermanent and no one knows when they will die. Further, no one is independent; we are all influenced by our afflictions that lead us astray. Fearing death, the Karmapa commented, is not worrying about getting sick in Bodh Gaya, but fearing that one has not turned one’s mind fully to the Dharma—the only thing that will benefit us as we pass into another life. The Karmapa began the actual preparatory tantra by first counseling everyone to develop the highest motivation commensurate with this highest tantra: to attain liberation and omniscience. If we seek to enter a mandala that transcends this world, our motivation should match it. Given our encrusted, thick habitual patters, we need to constantly check and improve our motivation. This setting of our motivation is the most important part of the preparation. If it goes well, then the rest of the empowerment will, too. The Karmapa also gave the refuge vows in Tibetan for lay people and repeated them in English and Chinese so that people could understand the meaning. As the Vajra Master, the Karmapa then blessed the body, speech, and mind of the disciples, commenting, “Everyone has buddha nature in their being; they have the essential nature of a buddha’s body, speech, and mind, so this inseparability of our nature and the buddha’s nature is not something newly made but there in its purity from beginningless time.